Release date: September 24, 2013. This new novel by Newbery winner di Camillo will not disappoint her many fans. The genre-busting story involves a lonely 10-year old girl, Flora, who is obssessed by superhero comics. Without giving too much away, she rescues a squirrel who's been vacuumed by her neighbor's high-tech powerful vacuum cleaner, named Ulysses. Flora adopts the squirrel, who gets named after the vacuum cleaner (with a wink to Greek super-heroes of yore). The squirrel has undergone a metamorphosis of sorts, transformed into a mini-super-hero himself, able to understand humans, lift up vacuum cleaners with one paw, and even write poetry. 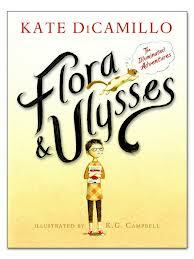 The unique friendship and adventures of Flora and Ulysses and their friends populate this delightful novel, which shines with a variety of perfectly realized characters. Kudos to di Camillo for her ability to create another small masterpiece of children's fiction. The pencil drawings by K. G. Campbell are pitch perfect as well, combining traditional illustrations with graphic novel style elements. 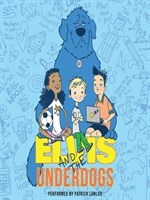 Elvis and the Underdogs, by Jenny Lee (Balzer + Bray, 2013). This is a hilarious and touching story of a 10-year old boy, Benji, who has been sickly from birth. Because he has a tendency to faint without warning, he is given a choice between wearing a god-awful enormous helmet to protect him in case of a fall, or a therapy dog. Needless to say, he chooses the dog. The dog is not just your run-of-the-mill therapy dog, though--he's a 200 pound Newfoundland named Parker Elvis Pembroke IV whose whines and barks sound like spoken English to Benji--and only to Benji.. It turns out there's been a mix-up and Elvis was supposed to go to the White House to serve the president. Elvis is incredibly bossy and full of self-importance, but brings out the dog lover in everyone, bringing new friends and a whole new world to Benji. A real winner for middle-grade readers, this would also make a great read-aloud.